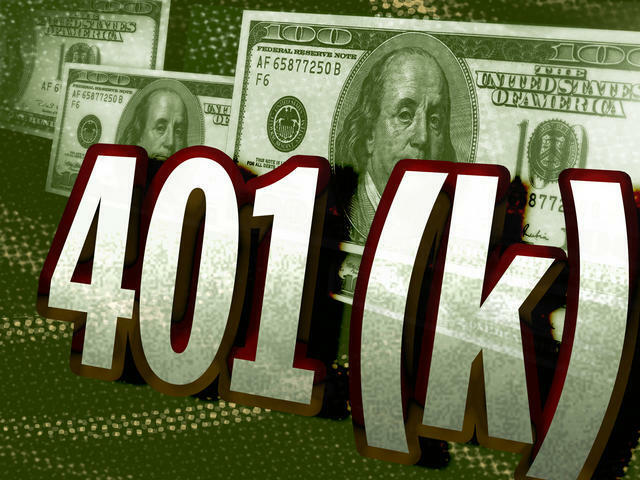 A significant increase in the number of people taking loans out on their 401(k) retirement plans is seen by analysts as fresh evidence of hard economic times. One-in-seven people took out such loans last year -- up by double digits from 2009, according to the consulting group AON Hewitt. Sheri Chaney Jones, of Columbus, Ohio, started a consulting business in October and borrowed from her 401(k) to help pay her bills. "It was extremely easy,' she told CBS News, adding that her financial planner told her "she was seeing more and more people" do it, "because the banks were not giving loans out traditionally to small businesses anymore." "It's not right for everyone," Jones noted, " but it is your money, you can borrow from it tax-free, you do pay yourself back at interest, but a very low interest, much lower than maybe a traditional bank." "What I feel optimistic about," Jones says, "is that I will be able to grow this business to not only pay myself back at the current interest, but continue to contribute more toward the 401K than I would have if I would have stayed where I was." On "The Early Show" Thursday, financial journalist and Newsweek columnist Joanne Lipman said, "Right now we have 30 percent of people who have 401(k)s have loans against their 401(k)s, which is a historic high. And the problem is, it's growing like crazy: By 2014, we're expecting to see 30 million people take loans against their 401(k)s.
"It's a big, big problem," she remarked to co-anchor Chris Wragge, "and it's one that's really been under the radar. And the big problem is that, if you lose your job, you have to pay that loan back within 60 days. So suddenly, you have no income, you owe all this money back, and the fact is that most people are unable to pay it back. "There was a survey recently that found that 70 percent of people who lose their jobs are unable to pay back the loan and go into default. And the number is even higher ... for young people -- it's closer to 80 percent." It gets worse: "If you go into default," Lipman pointed out, "you've just raided as a piggybank your 401(k), you don't have retirement funds and you owe taxes and penalties." Still says Lipman, "There are certain times when it makes sense. If you're secure in your job, if there is a one-time expense -- let's say you need money for a down payment on a home, that's fine. You know, that makes sense. Or for education, for medical expenses. You know, that can make a lot of sense. Because you are paying yourself back. And if you can stay on track, you're fine with that. "But the problem is, when you use it as a piggybank. When people are using this to pay for a vacation, to pay for a home that's perhaps larger than they can afford - that's where we really get into trouble." There are other approaches, Lipman says. "One alternative, and it depends on what's right for you, but one alternative could be a home equity line of credit. And in that case, you're paying probably a higher interest rate, but on the plus side, it's deductible, and it's not tied to your job. So you don't have to worry about having to pay it back suddenly."